Easter Sunday was very, very good to Bubba Watson. In a wild day at Augusta National Golf Club Bubba outlasted his playing partner for the day, Louis Oosthuizen of South Africa, on the second sudden death playoff hole to cap off a fantastic week at the 76th edition of the Masters Tournament. Both men finished with a 10-under par 278 through the regulation 72 holes so it took an extra trip down the 18th and 10th holes to settle the score and declare a champion. 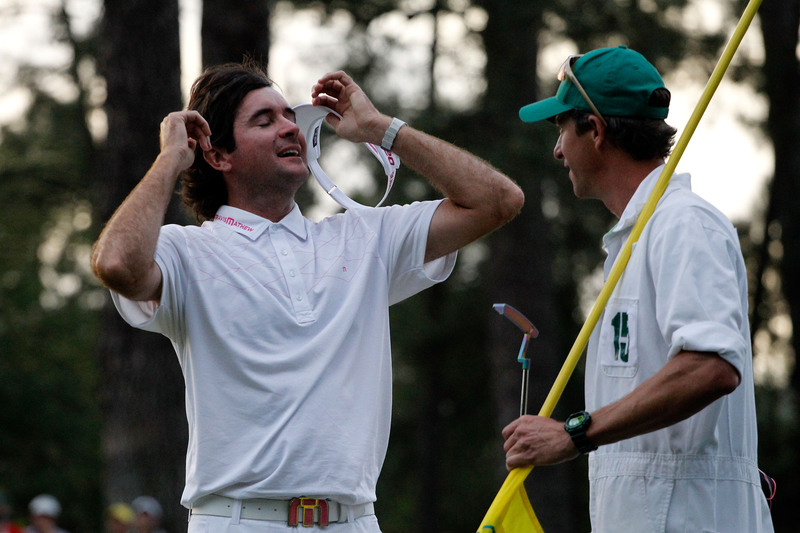 Bubba Watson started the day by witnessing Oosthuizen hit one of the rarest shots in golf and then ended the thrilling afternoon with a signature shot of his own to win the Masters, ensuring that this Easter Sunday is one that he will never forget. The day started off incredible, with Oosthuizen setting the tone for the day with the fourth double eagle (or “albatross”) in Masters tournament history (and the first to be televised) after holing his 4-iron from 253 yards out with the help of a 90+ foot dance on the green for a score of deuce on the Par 5 second hole at Augusta National. Words do not do that incredible shot justice, so I have included it below for your viewing pleasure. That shot gave Oosthuizen the early lead at 10-under for the tournament, the score that he would eventually finish the tournament at after playing par golf for the remaining 16 holes. As incredible as that shot was Bubba Watson was not intimidated and he kept himself cool, calm, and collected, knowing that the back nine was playing pretty favorably for the athletes on the day and that he would have a chance to make a move if he played his game. After making the turn with a 35 on the front nine, Bubba went out and did exactly what he wanted to on the final 9 holes, riding the birdie turkey train on holes 13, 14, 15, and 16 after bogeying the par 3 12th hole. Watson finished the back 9 with a 33, closing the day with a 68 and with a tie with Oosthuizen at the top of the leaderboard. They then went to a sudden-death playoff, starting with the 18th and then culminating at the 495 yard par 4 10th hole. Both Watson and Oosthuizen both hit the green in regulation at the first playoff hole, but missed birdie putts and tapped in for par to force one more playoff hole. The two players made their way to the 10th and missed the fairway with their drives, but Watson (driving with a pink shafted driver) missed so far right that he was deep in the trees and unable to see the hole. He then hit a recovery shot that will be in the Masters highlight reel for years to come, and that for all intents and purposes won him the 2012 Masters. Watson, who rarely hits a shot on a straight line, hooked his wedge shot about 40 yards, keeping only about 15 feet off the ground until it got under the tree standing in his path, and put his shot from the pine needles from 155 yards to about 10 feet from the hole. Oosthuizen missed the green with his approach and Watson was able to two-putt for par to win his first Green Jacket and become the Masters 2012 Champion. He instantly became very emotional, crying into the arms of his caddy as the weight of this life-changing moment hit him and he thought of the son he adopted barely two weeks ago. From everything that I’ve read and heard about Bubba Watson he is a great southern gentleman from the Florida Panhandle (A Georgia Bulldog by way of Milton (FL) High School where he played with fellow PGA Tour members Heath Slocum and Boo Weekley) and a man who wears his heart on his sleeve. Asked in the clubhouse by Jim Nantz to put what being in this position meant to Watson he replied “I never got this far in my dreams…it’s a blessing to go home to my new son, it’s gonna be fun.” Today we saw that raw emotion from Mr. Watson, and I’m not afraid to admit that it hit me a little bit when he won too, knowing that my pops was up in heaven watching the drama unfold as well. It was a perfect way to end another incredible week at Augusta National and I am already excited to see what the 2013 tournament brings. today belongs to Bubba, your 2012 Masters Champion and newest invitee to the Champions dinner. Congratulations, he deserves it! This entry was posted in Country Club and tagged Augusta, Augusta National Golf Club, Bubba Watson, Country Club, Louis Oosthuizen, Masters. Bookmark the permalink.